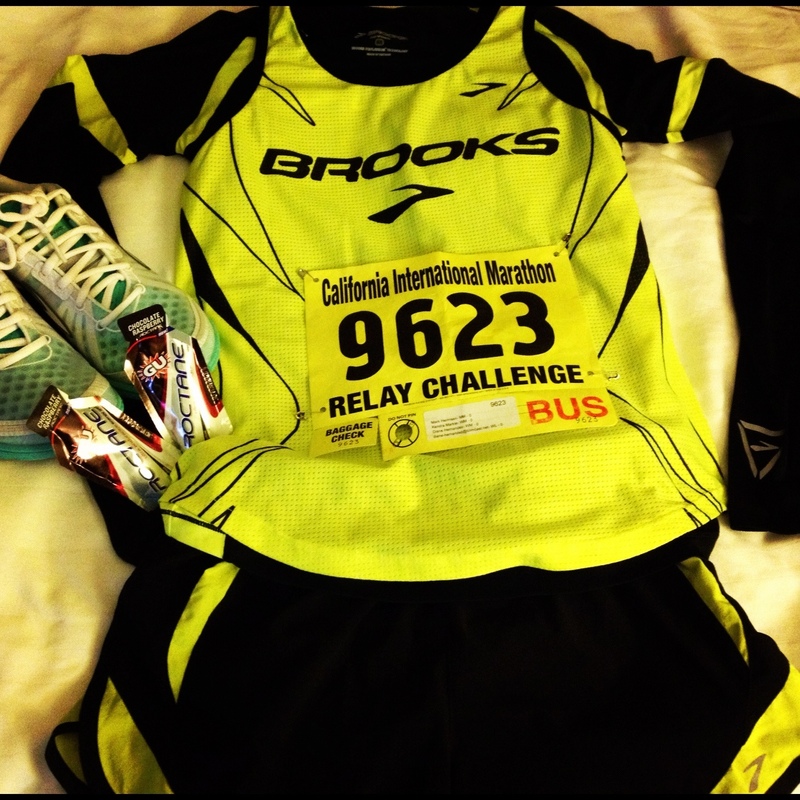 On December 4, 2010 – I intended to run the California International Marathon. I just didn’t intend to run it, I intended to PR at this marathon. This was to be my 11th full marathon (12th if you count Ironman). However, due to an unforeseen issue I was having, my last 5 weeks of training did not go as planned. 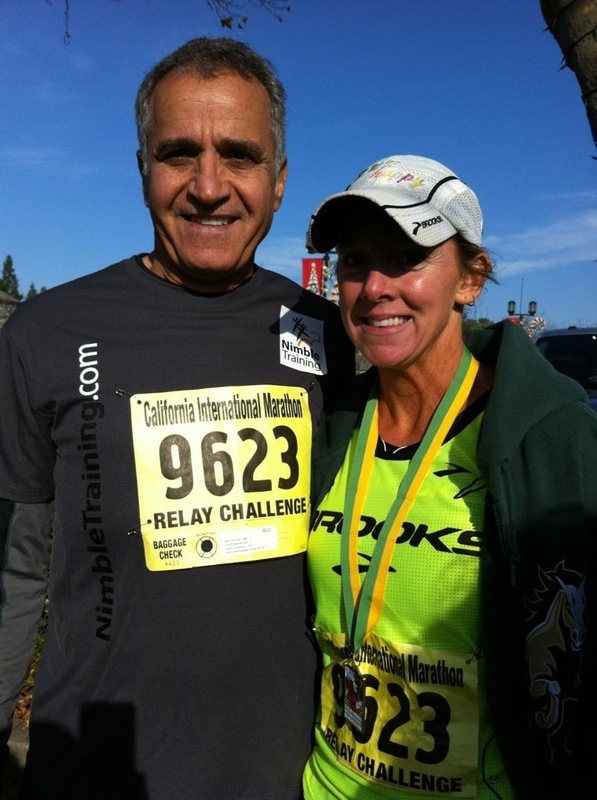 My coach, Daryl, and I had a long discussion on letting the marathon go and focusing my attention on getting healthy for the 2012 TRI season. It was hard to let it go because I knew I could run 26.2 miles, I knew I could gut it out and just do it for fun and not focus on my time, but in the end, I agreed with coach and decided not to run the full marathon. …and Daryl did say I could run some of it! That’s it … I’ll find a team to run with! And, that is precisely what I did! As luck would have it, I found a team! Or, they found me … we found each other. Her name is Joy and she is co-founder of Nimble Running, which is a running group training for marathons, half marathons and triathlons. After a few email exchanges, we met at the expo and got our race packets. Joy was in charge of a lot of teams and ours would have 3 people. I was asked to run the first two legs of the relay. No problem! I also met Dianne, and her husband Mike. Dianne was running leg 3 and another fella by the name of Yousuf was running leg four. RACE DAY: The morning was chilly and I planned on running about an 8:00 min mile pace. I told Dianne that I would see her around 8:45 am that morning at the relay exchange. We were bused from our hotel to the start in Folsom. We were allowed to stay on the bus as long as we wanted, all the way up until the start. This was a nice amenity. Also nice, was the amount of port-o-potty’s they had! I didn’t remember this many last time I ran this marathon in 2006. I had no wait time! Awesome!! The start was not seeded and you could put yourself where you wanted. Of course, many people start out way too fast (me included), but hey, I was only running 1/2 of this thing anyway, right?! The first 6 miles clicked by and I was feeling great! No pain, no “issues” like I had been having. My legs were fresh, almost too fresh as they hadn’t seen running shoes or pavement in two weeks. I passed the relay check point at mile 6 and wondered if the second relay check point would be at mile 12. DANG – I should have looked through the materials I was given at the expo! I guess I just assumed I would be running 13.1 miles. ….AHHH, I start to ache … and hurt. NOT muscle soreness, the other issue! SUFFERING SUCCOTASH. I am hating life and want to quit, but don’t want to quit because Dianne is waiting for me. I wish now I had only signed up for one leg of the relay. What was I thinking? I start to slow down and even walk a bit, but then talk myself into running some more just to be done with it. I pass the 13.1 mat and do NOT see the relay transition. WTHell? Where is it? I’m hurting here!! I call out to anyone who will listen and ask where the second transition is. I hear someone yell back it’s a ways up. Great. Just Great. Finally, I see the transition and find Dianne and her husband, Mike. I get my medal and Mike took a picture of us. I was happy to be done and happy to see her. Mike was great and treated me to an ice cold water at a nearby grocery store before we headed off in search of transition #3, We found Yousuf and waited for Dianne to finish her leg. Overall, we did great as a team. I was happy with my overall pace, roughly an 8:22 pace for 13.1 miles. And, although I had a rough go of it with my “issue,” AND I haven’t run since, I’m still really glad I met such wonderfully nice people and was grateful to be on their team. I had dreams of doing just one marathon in my life. Just ONE. Wouldn’t a marathon be such an accomplishment? YES! I want to do one!! 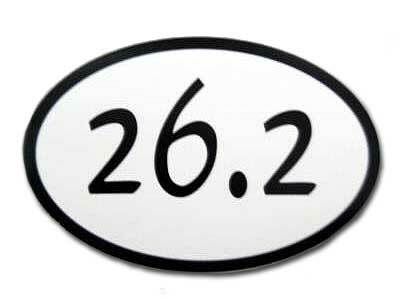 And, I want the 26.2 sticker! I intended to complete a marathon in my 20’s. However, those 20’s seemed to flash by with college, a new job, and having two kids. By my mid-30’s, I thought I’d better get cracking if I planned be able to actually run 26.2. Mind you, I wasn’t out of shape. I was a physical education teacher. I loved to exercise and teach kids the importance of fitness, but I was always a short distance type runner, maybe a mile or two at best. Nothing in my vocabulary screamed endurance. At all. In fact, I think my longest run had been about 6 miles. 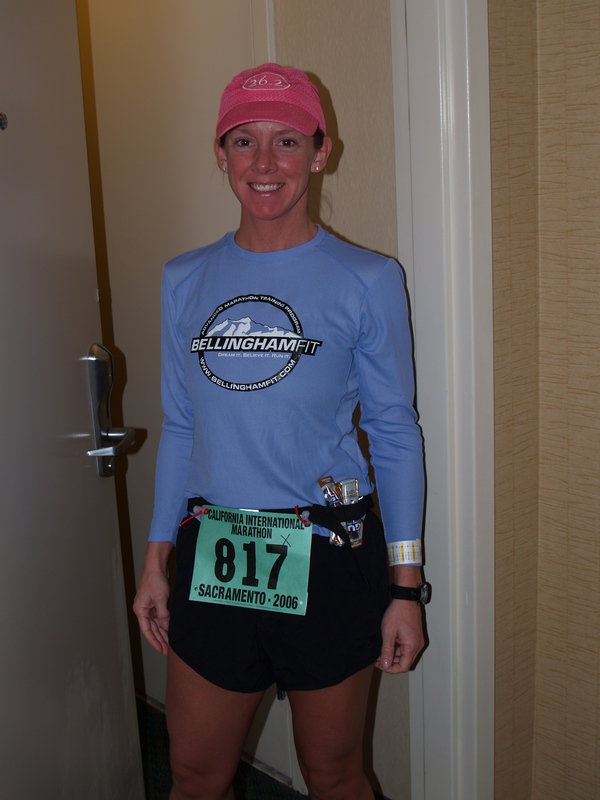 So, in the spring of 2006, I joined Bellingham Fit, which is a marathon training group in my area. Every week, I met the group on our Saturday training runs and my miles slowly started to increase. When I hit 8 miles one Saturday, I exclaimed, “Oh my goodness, I can’t believe I just ran 8 miles! That was awesome!” My new running buddies would chuckle after subsequent training runs when I surpassed my mileage every week and I would exclaim the very same thing with my new mileage. I was going to do this! I really was! 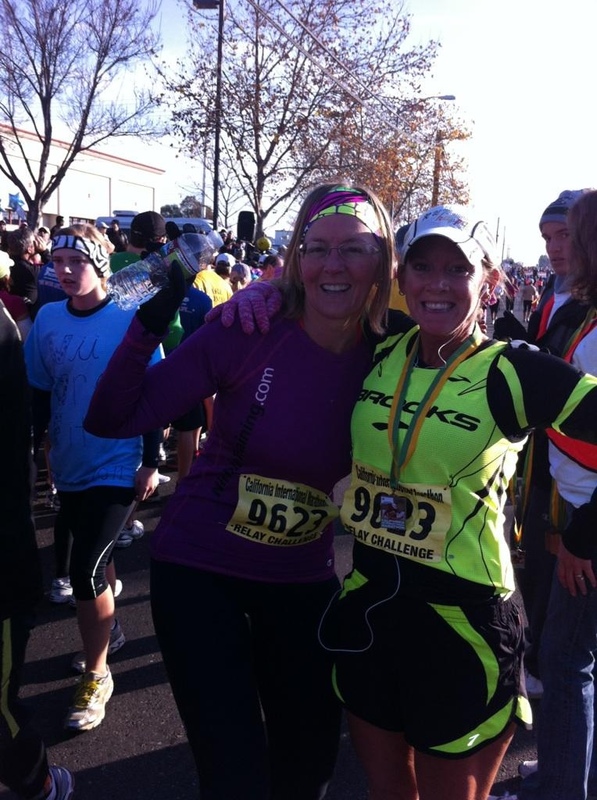 My new running friend, Jen, and I ran a similar pace and we decided to travel to our first marathon. Heck, we were running so well, we thought me might even qualify for Boston on our first shot! 😉 So we signed up for the California International Marathon in Sacramento. 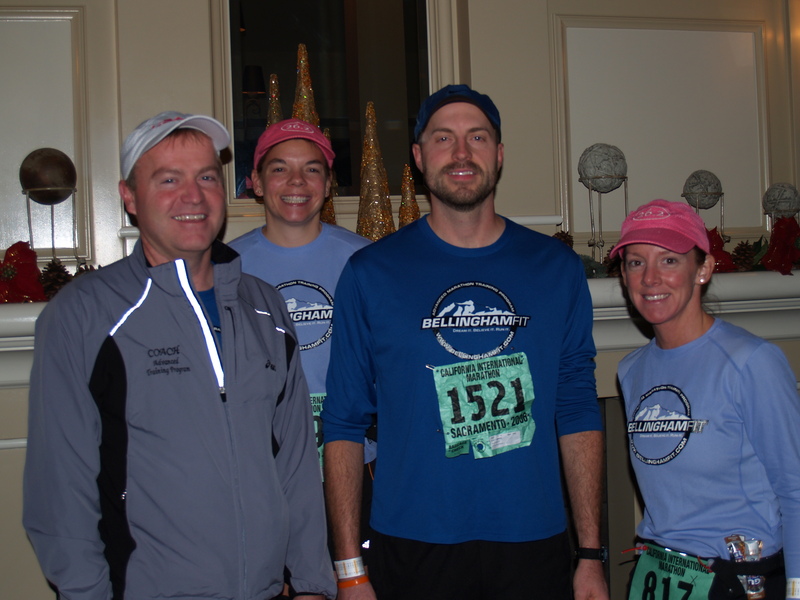 Our coach, Todd, and running friend Stacy, also came with. The CIM was deemed to be a fast course and a top Boston qualifying course. Plan A: Qualify for Boston. Plan B: Sub 4:00 hours. Plan C: FINISH! (I like plans). 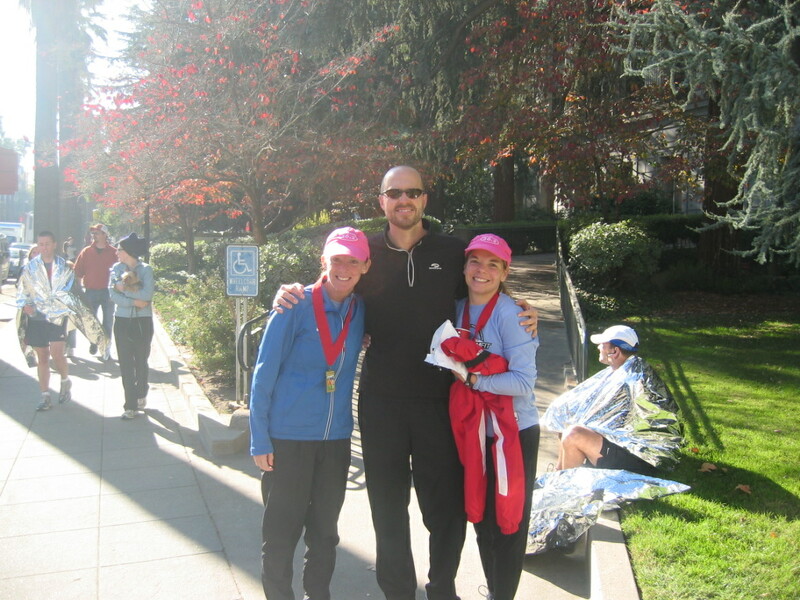 Jen and I had matching shirts with the Bellingham Fit logo, black shorts, and matching pink 26.2 hats. We were twins. We started off running our pace, an 8:30, but after the 1/2 way point, I lost Jen somewhere in the crowd of people. I had been with a pace group up until about mile 20 and I saw THE WALL. Literally, a wall of balloons, saying “THE WALL.” Mentally, I was done and my legs were like bricks that did not want to move forward. Coach Todd jumped in with me and tried to inspire me to catch up to the pace group that was pulling farther and farther away from me.